It’s our favorite time of the year…graduation season! Follow our checklist below to help make sure your live broadcast goes without a hitch. To our seniors, congratulations on your graduation. To our teachers, cheers to summer break! Test streams ahead of time. If you’re able to test from the streaming location that would be ideal. It is much easier to address network issues before the day of your event. Hard-wire in when possible. This will give you the best/most reliable connection. Remember, your grant setup does not have built in WiFi. Check audio. Wearing headphones to hear the quality is key. Make sure headphones are plugged into the green audio jack on the side of the encoder, not the one on the back of the monitor. Promote your event! Promoting your event is just as important as the broadcast itself. A beautiful show doesn’t mean anything without viewers. 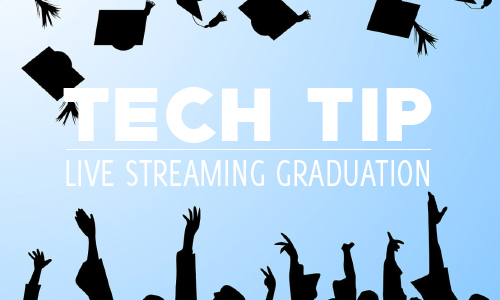 Invite teachers, parents, friends and the rest of the community to watch your graduation live online. Use inputs 2 & 4. Plug the BNC cable into the SDI out on the camera. Attach the other end of the BNC cable to input 2 or 4 for cameras to appear in Wirecast. If you are a phase 1 school don’t forget your converter box.Demo Video. Pre-make graphics for Wirecast. If you plan to use lower thirds or other name graphics (for guest speakers) do this in advance. Remember to press stream and record. Yes, your live events will auto archive to your ESE site, but we always recommend saving an extra copy to your computer just in case. Clicking Stream and record in Wirecast will save a hard copy simultaneously. Monitor broadcast from a separate computer. Did you know you can watch live events from a mobile device too?